I have upgraded the package libjson-c to make GIMP work, but it seems like the old version was used by the kernel, which is now unable to boot. 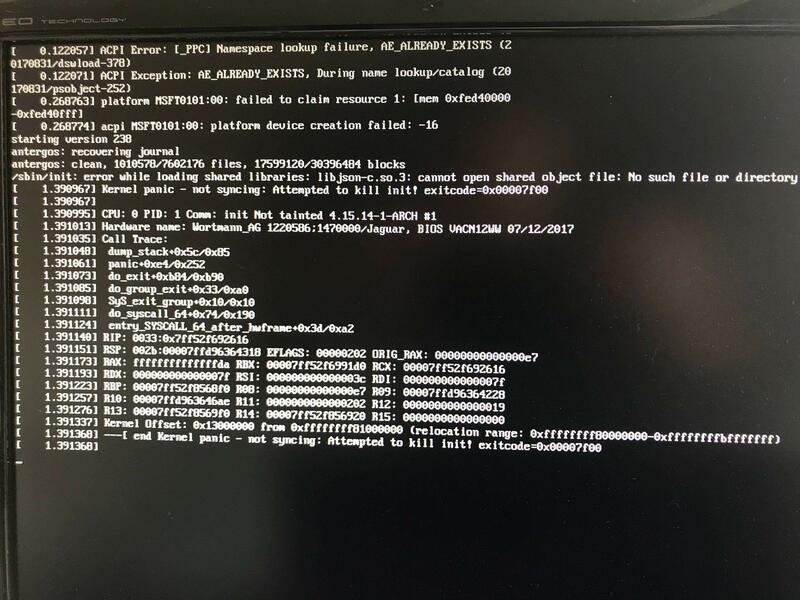 When I choose advanced options in the GRUB menu, both fallback versions (normal + LTS kernel) are not functioning, as I get the same kernel panic message. The next step I would take, is to boot into a live OS, but I don't know how I would go about reverting the package upgrade. would suffice, but I don't know how to achieve that. In case this is not possible, manually installing the package is also an option, though I don't know in what directory this would be done. Building the package from source and moving it to the correct directory would seem most reasonable in this case. Which directory would this be, though? I am using Antergos Linux and none of my partitions are encrypted. To solve the issue, you can do a full system upgrade from Antergos Live. Not the answer you're looking for? Browse other questions tagged pacman kernel-panic or ask your own question. What is a “kernel panic”?